Social customer service is the practice of providing consumer support through social media channels such as Facebook and Twitter to quickly answer questions. 69% of customers believe fast resolution of the problem is vital to good service, making social consumer support invaluable. Clearly, social media sites such as Facebook and Twitter have evolved to become more than emergent platforms for marketing and advertising. Increasingly, they are also valid and important channels through which consumers solicit and receive customer service. According to the Q2 2016 Sprout Social Index, 90 percent of surveyed consumers have used social media in some way to communicate with a brand. What’s more, over a third (34.5 percent) said they preferred social media to traditional channels like phone and email. Want tips on how to provide excellent customer service on Facebook? Read our guide, Tips for Providing Great Customer Service on Facebook. "Social care" is not a new concept, yet providing multi-channel support that includes social media can present real challenges for B2B and B2C companies both large and small—as well as opportunities to positively impact sales and customer loyalty. The reality is that customer service expectations are rising year over year and consumers are looking to brands to create a seamless experience that spans the showroom floor to the Facebook timeline. Simply having a social media presence is no longer enough; your job is to be a social media rock star. But how? 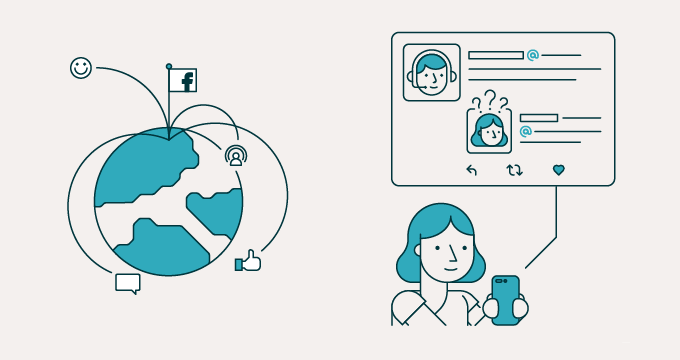 In this guide we'll explore some best practices for an employee to deliver great customer service through social media, whether you're just getting started on the job or taking your social care to the next level. One of the first challenges to providing great social customer service is determining where to focus time and resources. While marketing efforts may drive traffic to targeted social sites, customer service teams must meet their customers where they're already socializing. For most companies, Facebook and Twitter will be the primary focus for social care, but some brands may find that their customers also frequent Google+, LinkedIn, Pinterest, Instagram, or other social sites. To feel out where your audience is, search for mentions of your brand within popular social sites. Whether this is a first step toward creating a social media presence, or something your marketing department has already done, it is a mistake to leave dialogue about your brand solely to online commenters and the Google search algorithm. If you find that your audience aren't yet talking about your brand online, look for ways to include yourself in conversations relevant to your industry. The way, for an employee to be welcomed into social conversations is to add something of value. Because the consumer—not the brand—wields the most power over a brand's image on social media, the bottom line is that neglecting conversations that occur on sites like Facebook and Twitter can have staggering consequences. Conversocial reported that 88 percent of consumers are less likely to purchase from a company that leaves questions on social media unanswered. Craving more social media tips? Read our guide, How to Provide Great Twitter Customer Service. Many marketers are already familiar with social media monitoring tools that automate the process of searching for mentions of a brand name, or combing social media pages for specific keywords, but listening is equally important from a customer service perspective. What's more, many customers already believe that you are. In fact, research from the Institute of Customer Service reveals 1 in every 3 customers turns to social media to seek advice or communicate with a business. Depending on how much volume your brand's social media pages generate, it's an important part of the job to collect and analyze activity so that you understand the kind of issues being raised over social media. Smaller companies may need to collect a week or month's worth of activity while larger companies can probably take a pulse over a shorter period of time. How many comments appear to be written in moments of frustration, perhaps after having a poor customer experience in person or online? How many are technical or account-specific questions? How many questions can be answered using links to existing help content? How many brand mentions require, or would benefit from, a response? What time of day are your customers most active on social media? The answers to these questions will help you plan staffing and resources, define priority criteria, make decisions about self-service options, and determine whether you'll be able to handle the majority of issues directly through the social channel or require a process for directing social media users to another line of support. There are tools that automate the process of calculating volume and time, and an employee can generate reports to provide you with a complete picture of customer demand. You may learn, for example, that the hours your audience is the most active on social media do not align with your actual work hours. The size of your company and industry vertical will affect your social metrics. Some companies will see a lot of what amounts to "noise" via social media, and their challenge will be to sift through the noise to find the top priority contacts that require a response from an employee. Other companies will find that the majority of their contacts are direct requests for customer service. Depending on the volume of social interactions your brand generates, and the size of your staff, your ability to keep track of social inquiries (and your responses) may be made easier by a customer service platform that can integrate with social media and turn posts, tweets, and direct or private messages into tickets. In this way, you can easily triage, track, and escalate issues behind the scenes, yet still respond to the customer in the space where they have contacted you. As a best practice, it's not necessarily wise to simply turn every social media mention into a ticket, either because your company's social media pages are so heavily trafficked that the volume becomes unwieldy, or because every interaction does not require a response (even if it feels like it should). Still, what an integrated, multi-channel customer service platform can provide is context. The more you can see about a customer's history, the better. Are there open or prior conversations with this customer? Who did they interact with, and what was the outcome? Have they had this same issue before? Have they already tried reaching customer support through traditional channels or was Facebook their first line of defense? If you already have user data stored, agents can eliminate back-and-forth questioning for basic (or private) contact data. Smaller businesses without a need for a customer service platform might try one built specifically for social media ticket creation and management (rather than phone, email, and chat support) or, at the very least, utilize the private or direct messaging features of Facebook and Twitter to help create an archive of interactions. REPEAT THIS MANTRA: TIME IS OF THE ESSENCE! It's worth restating: speed of response is critical. "Live help" typically refers to phone or chat support, yet in the customer's mind, social media is a gray area that more closely straddles the line between chat and email support. There is the potential for help to be instantaneous if social media is constantly monitored, but more likely, help will arrive hours later. Several studies have found that most people feel they deserve a response over social media within the same day. That’s pretty reasonable considering the Northridge Group reported that 42 percent of consumers expect a response to their customer service inquiry within the hour. Of this group, 17 percent expect a response in minutes. These can be difficult service levels to meet, though some companies are beginning to. One of the challenges to providing social care when you're not using the follow-the-sun model of support, is that tweets and timeline posts can languish overnight, driving your response time from just a few hours to 10-20 hours later. As a best practice, always respond with immediacy—or with the promise of. This can be tricky without being able to send an email autoresponder, but one workaround that problem is to prepare a boilerplate message catered to each social channel that lets users know you've seen their comment and that you're working on a resolution. Speed isn't everything if you're not able to resolve the customer's issue. As a general guideline, if you can easily answer a question posed over social media in the space of a comment or tweet, and the answer can be public, then by all means, do it. But more important than providing an answer through the same channel it was asked, is providing a timely and correct answer. This might involve providing a first response over social media that moves the conversation to another channel of support. SOCIAL CARE IS CARE. PERIOD. The success of your social care efforts will depend, as ever, on the quality of care you provide, but you might want to pull out the kid gloves because providing great social customer service can require extra special handling. Agent responses must be timely, accurate, sensitive, brief, and friendly—a tall order. Agents must respond quickly but not so fast that the problem isn't properly resolved. Agents must employ their customer service skills to read into a customer's emotional state and properly determine when the informal nature of social media, such as the use of smiley faces or emojis, are appropriate for conveying friendliness and willingness to help, or when a more formal statement of empathy or apology might be required before addressing an issue. Then there is the issue of length. Can or should the issue be resolved publicly, within the limited real estate of a comment or tweet? Is the agent trained in, or capable of, drafting custom replies without errors? Popular myth suggests that the young and tech-savvy are best equipped to handle social media, but some large companies have reported success using seasoned customer service agents, trained specifically for social media. Active use of a site like Twitter can be an acquired taste—and a learned skill. Consider hosting a "Lunch and Learn" or equivalent to cross-train your staff on social media usage and etiquette. Often at smaller or newer companies, there is overlap between marketing and customer service, but as companies grow, shared skill sets, best practices, and communication guidelines tend to break down and become siloed. Cross-training will ensure that your teams learn from one another, and that your brand message and integrity are upheld at every point of the interaction. Once agents are trained at responding over social media, they have the potential to be more efficient, handling four to eight times the number of contacts received through social media as they can by phone, according to a report by Gartner. In addition to improved efficiency, it was also reported that providing excellent social care helps to foster a deeper emotional commitment to your brand, directly impacting your Net Promoter Score. DETERMINE WHEN TO TAKE AN ISSUE "OFFLINE"
Providing a public response to a question or complaint can go a long way. According to Conversocial, 95.6 percent of consumers are affected by other comments on a brand's social pages, and so it follows that consumers will also be affected by your responses to questions they see raised over social media. When you gain or lose customers based on customer service, it adds up in dollars. The good news is that customers can spend up to 20 percent more when a business engages their customer service-related tweets, as reported by Applied Marketing Science. But the reality is that not every contact over social media can be easily resolved in a single exchange (or in less than 140 characters), particularly if the issue is very technical or when the customer has many grievances to air. It can also be hard to know at the outset whether the customer will keep a thread going, cluttering your Twitter feed with @replies, so customer service reps must become adept at determining when to take a conversation from a public page to a private message, or perhaps off social media altogether—as well as when to bring the exchange back into the public sphere. sensitive personal data is required, such as email addresses, phone numbers, passwords, account or credit card numbers. One benefit to using a customer service platform that integrates both social and traditional channels is that you can use social media to let the customer know you'll send them the information they need by email, without having to request an email address. After an issue is resolved offline, it's important to return to the social channel and thank the customer for reaching out. Public interactions can be a double-edged sword, but the positive ones, when a customer has the chance to express gratitude for a great customer experience, is not the interaction to miss out on. While building a social media support strategy, it's worth considering what might happen if you moved every social interaction "offline" or to another channel of support. Companies with limited staffing and resources might find that they must, and when done well, the customer will feel like they received a response over social media and had their issue resolved. We're all familiar with that old adage, "When life gives you lemons..." The well-known implication is that it's possible to turn around a less-than-hoped-for situation with a change in attitude. This is particularly useful advice when providing customer service over social media, given consumers' proclivity to use social media to grab a brand's attention. A survey by Dialog Direct and Customer Care Measurement & Consulting found that in 2011, 20 percent of customers were using social media to communicate their complaints to a brand. By 2015, that number had increased to 33 percent. When this happens, everything depends on your response. Receiving negative feedback is an open invitation to rectify your brand's image and, more important, your relationship with the customer. The customer must feel like they've been heard and that you're willing to do what it takes to make them happy. Respond even when the user hasn't directly tweeted at you or asked for help. Answering brand mentions or comments that don't require a response, but might benefit from one, shows you're paying attention. Promote your customers by retweeting a happily resolved support interaction, or by "liking" helpful interactions that occur between customers. It's kind of like giving your customers a hug. Give your customer service team a public face by introducing who's on duty and how long they'll be answering questions. Consider posting a team photo or an agent spotlight. It's nice to connect the face of the brand with the names behind it. If feasible, follow up a resolved interaction with, "How is everything?" Promote self-service. Think about introducing a support tip of the week and assigning it a clever, unique, and easy-to-remember hashtag, or designating someone to update your company's social media accounts when a new article has been added to your knowledge base or help center. Don't neglect your customers. If you're going to provide customer service over social media, at minimum every direct support question should be answered. Don't delete (or hide) comments or posts. The only exception is when comments are clearly spam or in violation of posted community guidelines. Deleting a customer's negative comment in order to preserve your virtual image will only further enrage the customer and damage the relationship. Don't be defensive. It's important to remember that the customer, even when angry, has reached out to you. Thank them for bringing their issue to your attention, acknowledge their concern, and apologize for the trouble they are experiencing (even if you know it's self-wrought). Don't engage with a customer whose intent is to simply argue and publicly defame your brand. Sometimes your best defense is silence and, after a certain point, they'll damage their own credibility more than your brand's reputation. Don't overwhelm your customers with too much information, whether you're posting articles from a knowledge base or providing a too-lengthy response in a comment. Don't reply or respond to every customer in the event of mass issues or outages. When many customers are affected by a single issue, it's best to provide only public status updates that will reach everyone.